The other drink from Champagne, traditional Champagne Liqueur. Some producers make a traditional Champagne liqueur called Ratafia, although few export it. It is hard to find, certainly in the USA. 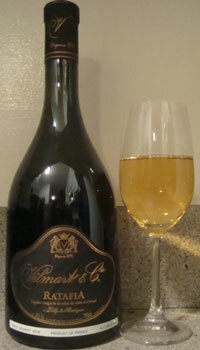 I'd describe Ratafia de Champagne as inexpensive and tasty. It usually is about the strength of Port wine, under 20% alcohol. Ratafia is normally served quite cold and in aperitif glasses. In my opinion, Port glasses work well. Ratafia is actually made in many regions of the Mediterranean such as Spain, Italy, and of course France. It is often a liqueur made with herbs, fruits, nuts, fruit pits, citrus rinds, and/or vegetables. You can find recipes to make this type of Ratafia online, and they often involve cheap wine, vodka, and flavoring agents. In Champagne it is made by mixing grape brandy with (unfermented) grape juice. You can also find Ratafia in Calvados, France made of apple brandy added to unfermented apple juice, and called "Pommeau." In Armagnac they make one called "Floc de Gascogne." Ratafia is actually from the Latin "Rata Fiat" meaning "it is ratified." A drink was often used to seal a deal in France, and this pleasant custom persists in many areas. Suggested matches include Fois Gras, Creme Brulee, fruit tarts, melon, and blue cheese. It also tastes quite well by itself. This was fairly inexpensive, about $15 a bottle from Premier Cru, and a great deal at that price. Comes in a bottle with a cork like a Tawny Port - easily removable/replaceable & no cork screw needed. The nose has citrus tones, raisons, minerals, and some brandy. On the palate this is quite pretty - almost like a white port. A great round mouthfeel. Some sweet fruits on the edges of the tongue, yet fairly dry. Not complex yet very festive. Interesting Vilmart uses 100% Pinot Noir aged in barrels while others often use Pinot Meunier and Chardonnay.